A serious student of Buddhism, Jack Kerouac was entirely self-educated about its principles and nomenclature. The book he read in those days was The Buddhist Bible, which was one of the first books to bring eastern teachings to the U.S.
No dilettante, Kerouac explored the lineage of Buddhist teachings and emerged with a deep, personal understanding of its concepts, such as emptiness, change, delusion and the peace that comes from no longer grasping. One book emerged from this study, though it was published in the late 1990s, long after his 1969 death. It is Some of the Dharma, and I stubmled on it when I was living in Rocky Mount in 1998 after returning from Prague. It was just published and I found it at the public library there. By the time I got around to ordering it, it was out of print but I found a new copy online. It has more than 400 pages of complex writings, such as Kerouac’s essays, haiku, images, poems and sayings. It also has his symbolic drawings and the typographical designs he created using typewritten words and sentences. Have I read it? I’ve tried, and covered more than 100 pages. It is dense. It sits on my bookshelf with other current readings, where on and off for years I’ve dipped in on those Sunday mornings when my mind is especially clear and receptive. He did a lot of his Buddhist study and writing while living in Rocky Mount, just outside of town in West Mount, with his sister, Nin, and her husband, Paul. This notebook represents one of his most serious periods of study, just before he moved to Rocky Mount. During the time of its writing, he sent his literary agent, Sterling Lord, several letters about his studies, along with several manuscripts. He moved to Rocky Mount by March 1955. ABOVE: Dharma (4). Manuscript notebook, Fall 1954 –January 1955. 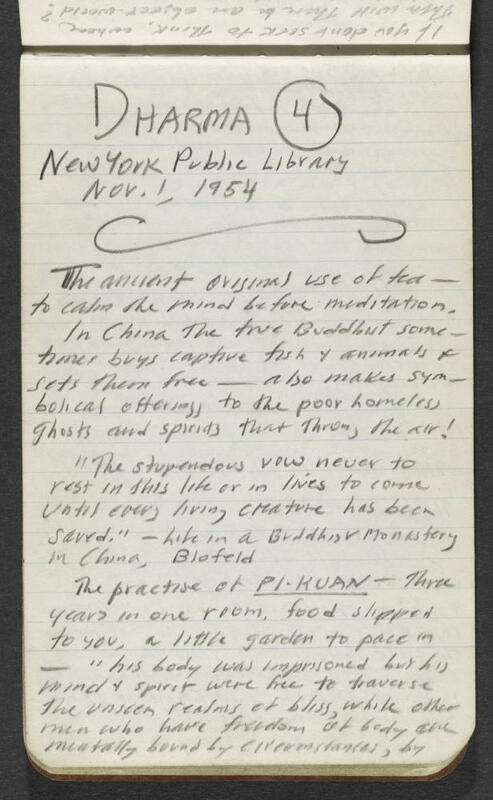 New York Public Library, Berg Collection, Jack Kerouac Archive. Reproduced courtesy of John G. Sampas, legal representative of the estates of Jack and Stella Kerouac. This entry was posted on February 28, 2008 at 4:09 am and is filed under Uncategorized. You can follow any responses to this entry through the RSS 2.0 feed. You can leave a response, or trackback from your own site. for me, Some of the Dharma is delightful. there are so many preferences to his everyday life in Big Easonburg Woods. this is one of my favorite Kerouac books, i also think Dr. Sax is Kerouac’s masterpiece.